With tuition fees as high as ever and formerly ironclad professions changing drastically or going extinct, colleges and universities are thinking risk-management. Perched on one of the most productive oil and gas reservoirs in the country, Williston State College in North Dakota is in a lucrative but precarious spot. As it trains students in the oilfield skills that can help them strike it rich, its faculty and staff are equally mindful of the predicament students will face when the industry invariably goes south. Williston State embeds industry credentials into many of its degree programs. Students finishing an associate’s degree in welding can earn certifications from the American Welding Society (AWS) or American Society of Mechanical Engineers (ASME). IT students can earn a variety of CompTIA certifications to demonstrate their progress and interests. The college’s primary reason for building programs like this is the same one that led Broward College in Florida, the leader of a national consortium in supply-chain management (SCM) education, to use an eight-part sequence of industry certifications as the bones of their program. In the Broward-led LINCS program, industry certifications provide evidence that students can do SCM work, and the associate’s degree lets employers know that students have broad knowledge and foundational skills in writing, math, and science. Partnered with an academic credential in this way, industry credentials give students several ways to communicate what they know and can do. But in one newer program at Williston State, industry certifications take on a different role, demonstrating specific technical skills that will be valued across sectors of our networked economy – whichever way the price of oil goes. Built in 2012 with the help of TAACCCT funding, the Applied Associate of Science (AAS) in Petroleum Production Technology was started to help North Dakotans cash in on the shale oil boom, connecting them to the industry’s well-paid jobs in construction, extraction, and logistics. The program shares important features with Broward’s associate’s in SCM. Students are prepared throughout the course to take industry certification exams. There are early exit points, where students can leave with their industry certifications and an intermediate academic credential if they need to. And, as in all other programs at Williston State or Broward, new students can use current industry certifications towards course credit for prior learning. The oil business is different from the supply chain business, though, and the programs at Broward and Williston State diverge in important ways, too. Supply chains aren’t going anywhere – if a worker loses their job at one company, they can probably find a similar role somewhere else. Oil, on the other hand, is a fickle commodity. Boom and bust are as much a part of the business as pipeline leaks, and Williston State’s staff know their students need to be able to find work outside the industry during downturns. Oil prices plunged following the Great Recession, for example, then leveled off during recovery, and then dove again in 2015. This might have spelled disaster for Williston State’s new program – and for its graduates trying to make a living off a very narrowly targeted degree. What can a worker do with a petroleum technology degree except drill for oil, after all? If they graduate from Williston State, they can do a lot more. That’s because the college and its four consortium partners decided to include what Pam Rasmussen, the grant director and a career navigator at the college, calls “mitigating competencies”: skills that can pay off at any point in a sector’s business cycle, and indeed in industries across the country. About half of the courses in the petroleum tech AAS have to do with the petroleum industry specifically. Some have embedded certifications: pipefitting skills can be validated with the same AWS or ASME certifications, and managerial “lease-operators” can become certified right-of-way agents. With work experience, the coursework can serve as a first step toward more advanced certifications from the American Petroleum Institute. The rest of the program might appear more at home in the IT department: networking, programmable logic, and industrial control systems. In fact, petroleum tech students take these courses with IT students, and their inclusion speaks to the complexity of today’s oil industry. If “drilling for oil” conjures the shots of rickety oil rigs in There Will Be Blood, your stock image is a bit out-of-date. There are still rigs, of course, but drilling in North Dakota’s Bakken oil patch is not just a matter of digging straight down. Once the drill bit reaches the correct depth, it must turn and proceed horizontally before a solution of sand, water, and chemicals is pumped into the rock to loosen the “tight” oil it contains. Drilling to the right depth and pumping the right volume and mixture of fracking solution depends on intricate remote sensors mounted on the well equipment, which send data back to control stations across wired and wireless networks. When the well is completed and oil and gas start to flow, another set of sensing, communication, and control systems kick in to keep things running smoothly. These sensors should also alert technicians to pipeline malfunctions, as they did after a rupture in South Dakota early last Thursday. A well-rounded modern oilfield professional can understand and manage all of these networked processes. 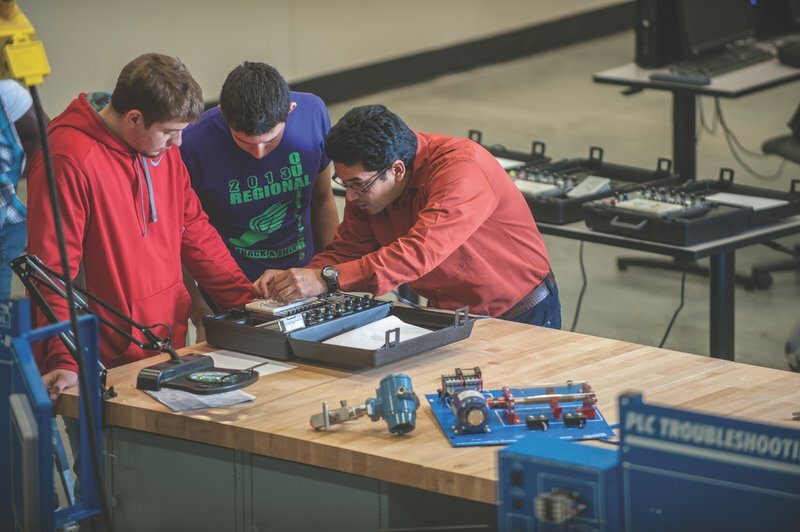 Achieving that level of knowledge often comes at the price of a bachelor’s degree in engineering, but Williston State is confident its students are ready with an associate’s. They’re prepared to earn Cisco networking certifications to prove they can troubleshoot interruptions in the flow of information between the well’s sensors and its control stations. A more recent addition is preparation for Rockwell Automation’s certifications in programmable logic, taught on Amatrol simulators, which attest to students’ ability to write the machine code that tells the rig how to respond to different inputs. Next year, lead petroleum instructor Alberto Bellina (pictured above, right) plans to embed more advanced electrical sensing and automation credentials from the National Institute for Metalworking Skills that will show that students can program and repair the sensors themselves. After that, he’s looking to robotics. Ken Quamme, the chair of the business technology department, has led the cross-linkage of petroleum and IT programs. To support the programs’ material needs (Amatrol simulators aren’t cheap) and to defray student expenses on exams, he scours the region’s business community to find employers willing to chip in to support their workforce. A network architect himself, he also works to show faculty and students how niche-seeming IT skills are used across the economy. That can mean anything from informal chats to webinars to field trips at local power plants, wastewater facilities, and industrial control firms like Triangle Electric. The networking and automation processes learned by Williston State’s petroleum tech graduates are indeed complicated, but they’re not esoteric. Some methods for laying underground utility cable are practically identical to drilling an oil well. Programmable logic controllers – sometimes the very same Rockwell Automation units – govern the machinery of food processing and advanced manufacturing facilities. And the massive combines and irrigation systems that drive modern agriculture are controlled not by humans at a wheel, but by computer instructions derived from similar networks of sensors. So if the oil market tanks, laid-off graduates can get similar jobs as automation or industrial maintenance technicians in a completely different sector. When widespread adoption of electric vehicles like Tesla’s new semi finally sound the death knell for oil, it could be Williston State petroleum techs servicing the industrial robots that build the fleet. In the meantime, they’re trained to satisfy America’s oil habit, and to respond as efficiently as possible when it leads to dangerous and inevitable mishaps. For Williston State’s petroleum tech students, then, their choice of major doesn’t mean a narrower field of career options. On the contrary, by embedding industry credentials that teach students to control the same systems that many Americans fear may automate them out of jobs, Williston State lets them both take advantage of the oil industry’s booms and stay afloat in sectors that will keep chugging during its busts. When industry credentials validate technical skills that will be in demand across tomorrow’s economy, choosing a program with those credentials built in doesn’t have to mean committing to one niche.